Home » Blog » Adventures » A Battle of….Wine? June 29th, 2012, a day that will live in infamy. A day I will never forget. 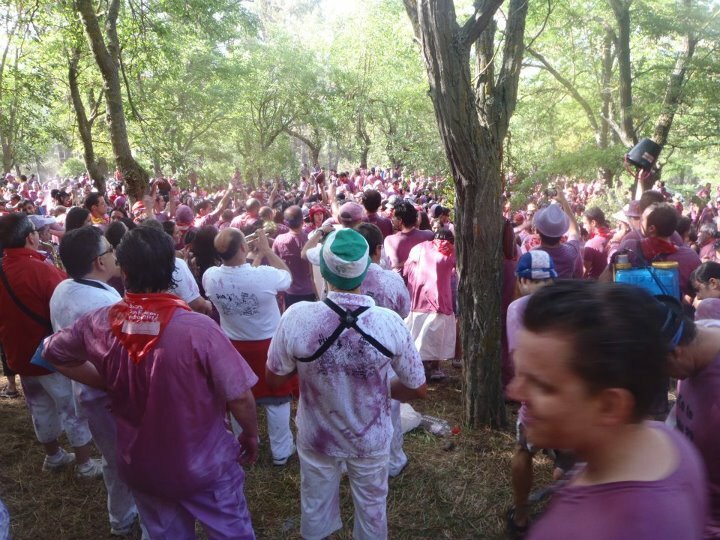 The day where I fought to the death in La Rioja‘s annual Batalla del vino (Wine Battle). Ok, not really, but still, it was an epic, slightly painful, but overall successful and super fun day! So what does a wine battle entail, enquiring minds might be wondering? Well, like most fiesta’s in Spain it begins with a saint and a pilgrimage. 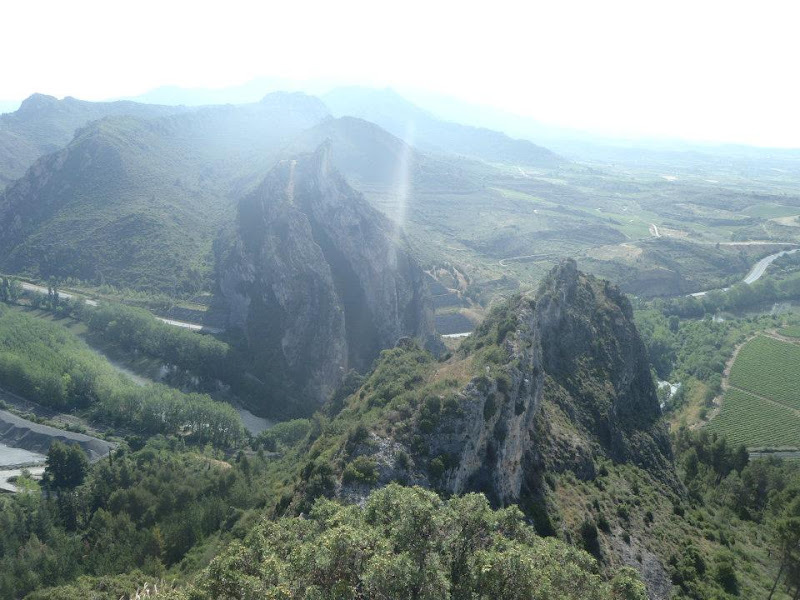 In the 6th century, San Felices de Bilibio died and was buried in the craggy mountains outside Haro in La Rioja. 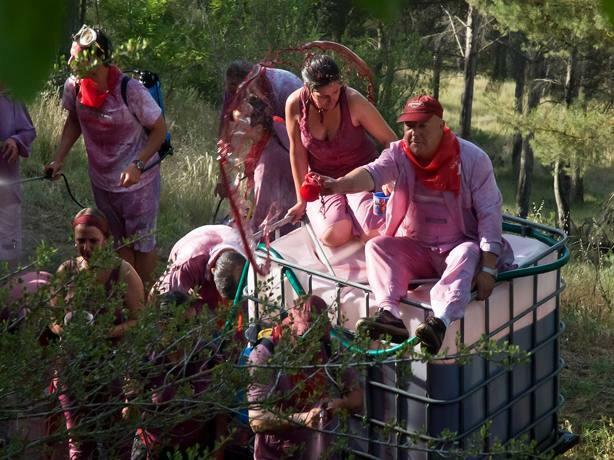 For centuries people would annually make a pilgrimage out to his tomb, and in true Spanish fashion, this religious custom somehow evolved into a giant wine fight. At this point, I am not surprised at all. Waking up at the crack of dawn with a major hangover from Logroño’s summer wine tasting event the night before, Riojano joven y fresco, probably wasn’t the wisest move. But I dutifully drank some espresso and put on my white clothes from the chinos and piled into our friend’s car to drive out to Haro. Most people stay out all night partying and then walk the 8km out to the mountains for the battle in the morning at 8am. However, we decided to sleep in and drive, passing by white-clad stragglers on our way. 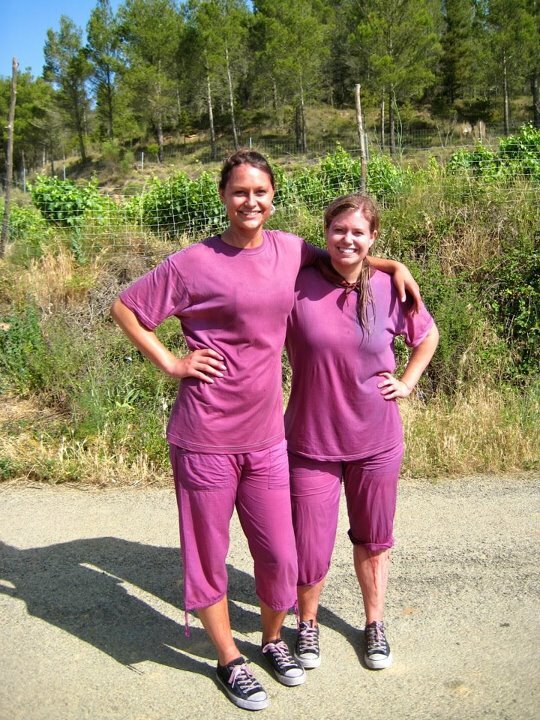 Before we even found a place to park, we were assailed with the smell of cheap red wine and could see a river of it running down the mountain along the road. What were we getting ourselves into? 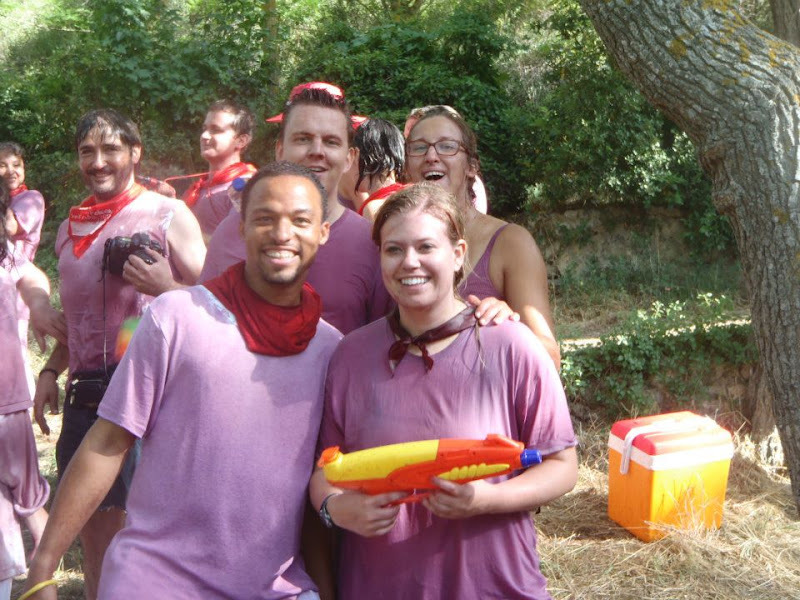 Armed with only water guns, we were not prepared for the level of intensity that awaited us. Men were lined up to the battle site, their arms full of buckets of wine or wearing pesticide backpack sprayers filled with tinto. 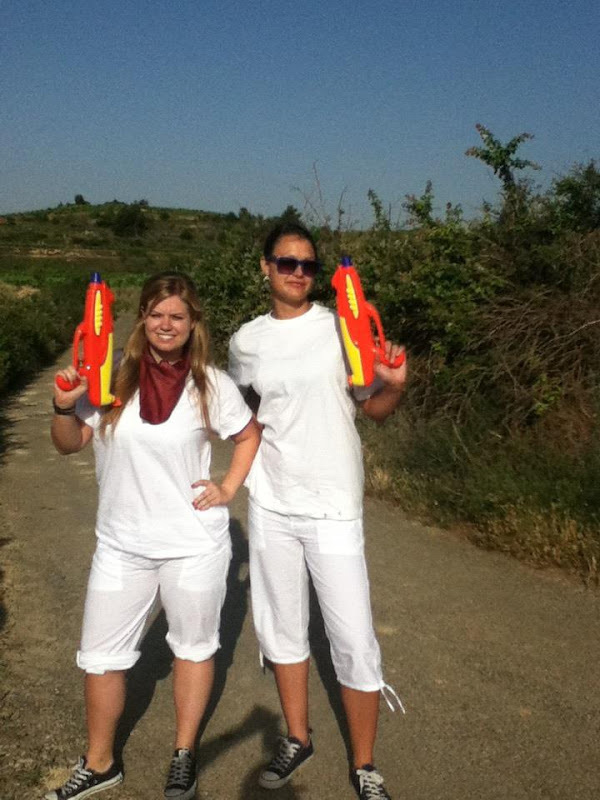 As soon as they spotted our white clothes, we were attacked! 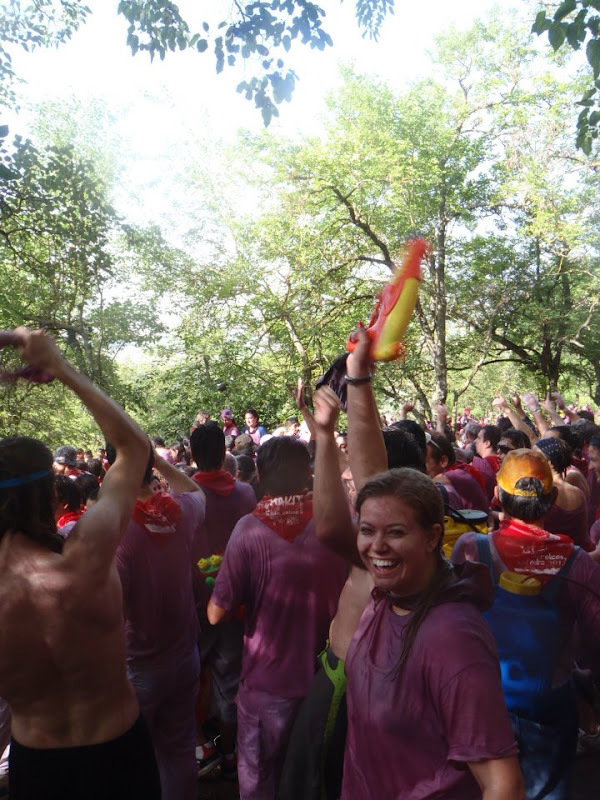 Then they noticed my bright blonde hair and foreign looking face, and screamed “guiris” before pouring buckets of wine all over me! 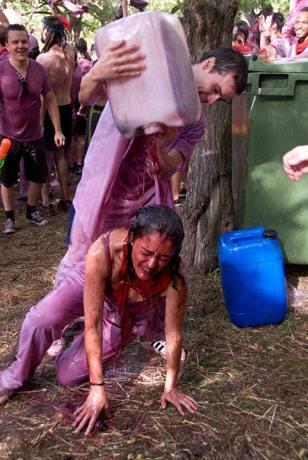 Before you worry over a waste of wine, they only use the worst wine for the batalla del vino, it’s basically vinegar and stings your eyes horribly! 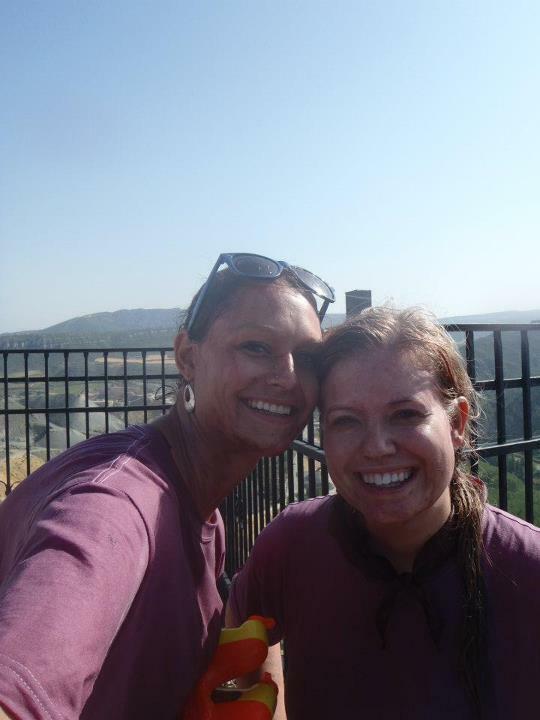 We shoved our way to the wine wagons, begging the ladies to fill up our squirt guns with amo. Some cheeky guy next to me dumped a bucket straight on my head while I was waiting. “Faster, faster, por favor” I begged the lady with the hose of wine. Dump! Another bucket straight on my head, “dude, I can’t see, it really hurts my eyes!” Whoosh, a third bucket over my head, “¡Pero qué coño! (loose translation, WTF)” I scream at him before squirting him right in the face. Revenge is sweet! 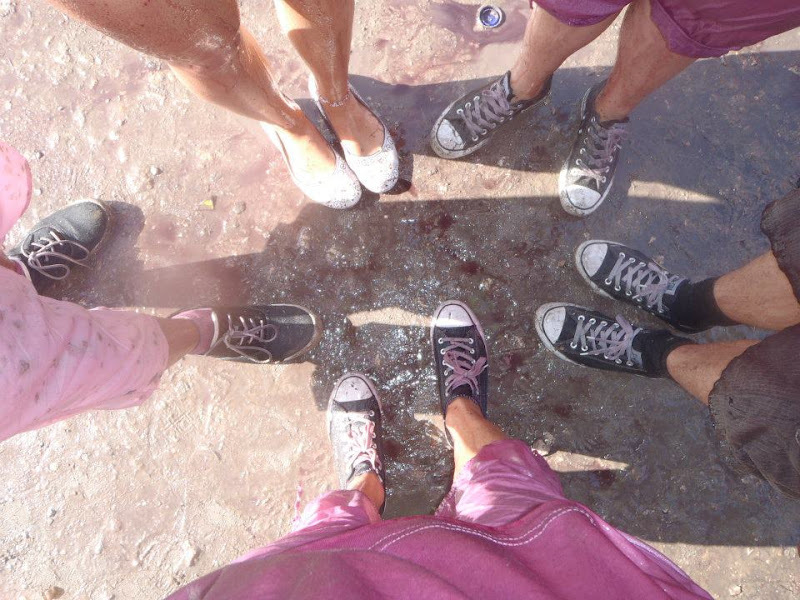 We ran off up the hill, weaving our way through the marching bands and crowds of purple people dancing and throwing wine every which way singing along. It was like a wine rain shower for a good hour! It was hilarious to watch the locals attack journalists and foreigners. If you were wearing even an inch of white that hadn’t been stained yet or carried a really nice camera, you were attacked immediately. We danced and sang and threw wine every which way, really letting lose and having a ball! It was worth getting up so early! It was a carefree, no inhibition, bats*** insane party that can only happen in Spain! Here is a great video that sums it up! After it was over, we climbed up to the tiny mountain church for a view before heading back to Haro to scarf down some breakfast and watch the parade of battlers stroll back town! 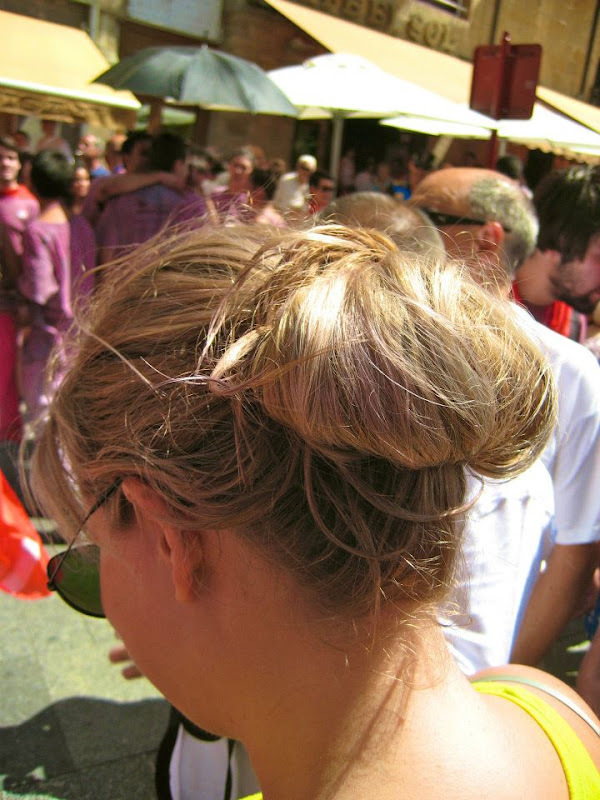 Did I mention my hair was stained lavender for a week? Tips: arrive on time at 8am, they run out of wine faster than you think! Bring a waterproof camera and even goggles if you have sensitive eyes. Don’t wear flip flops or sandals and wear only white, pants too since its so early it’s nippy. Come armed with amo, squirt guns or buckets or gallon bottles filled with cheap box wine to attack the guys guarding the wine hoses. And be prepared to get dirty! 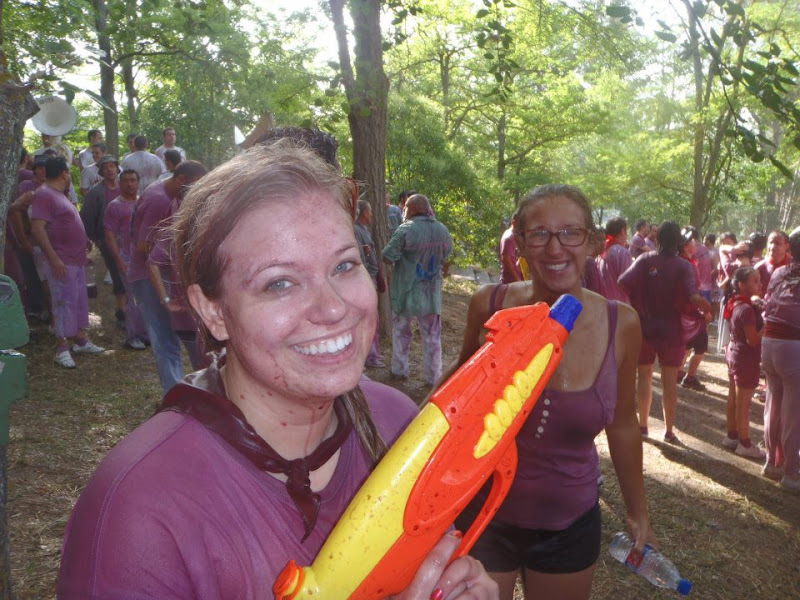 You will be bright purple in the first five minutes, so there is no point in trying to stay dry or clean! Bring a change of clothes with you and leave them in the car. Bring nothing valuable with you, it’ll get wet and ruined. 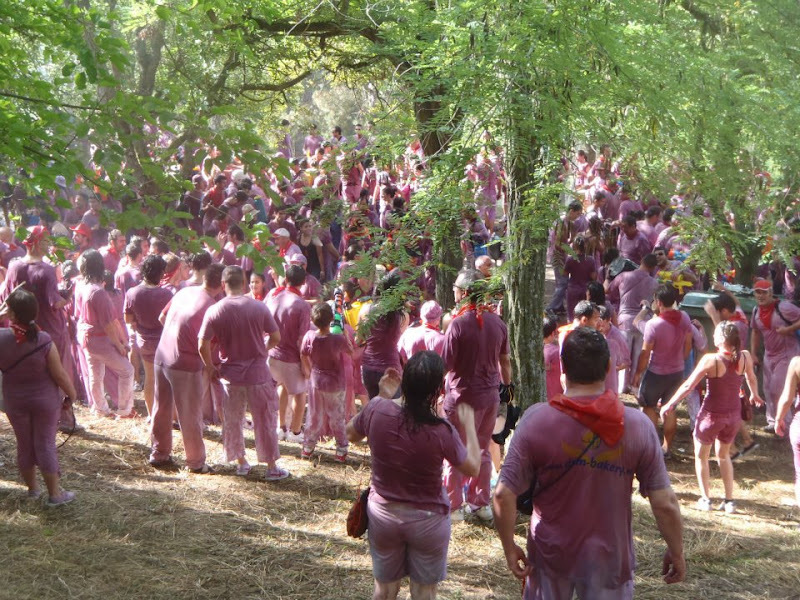 Have you ever been to the famous batalla del vino in Haro? Or a similar festival? Would you go if you had the chance? I love the before and after shot, ahahah! epic war is epic! how I love to join the war, it’s fun. Batalla del vino is great! Oh my gosh, that is hilarious! Usually I just like drinking wine, but I think I could get onboard with dumping it on people’s heads instead. 🙂 That’s crazy how purple your white clothes got! 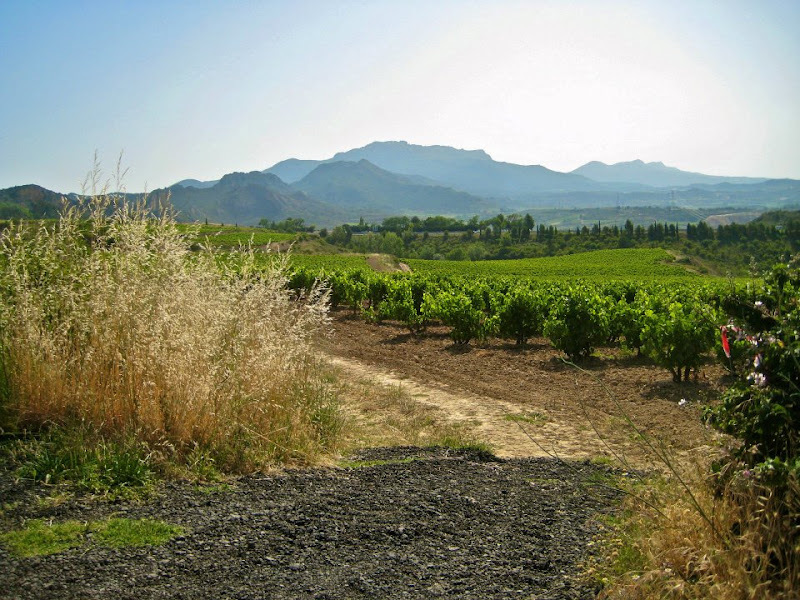 Stop Overlooking La Rioja, Spain!